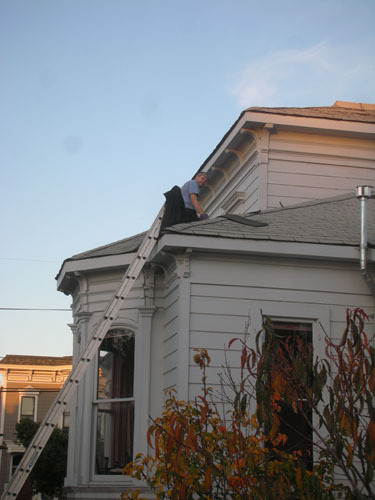 Fine weather arrived, and with it we sent Noel up the ladder onto the roof to do the shingles. 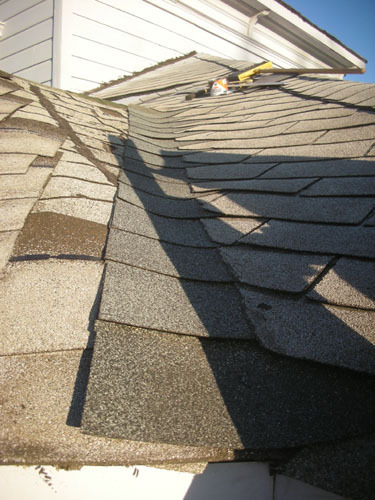 You will recall that some of the shingles on our roof were installed sideways, which had been causing leaks in the attic over our dining room (over a period of many decades). Yesterday Noel climbed up on the roof and pulled off the top layer of shingles, only to find a second layer of shingles on sideways. 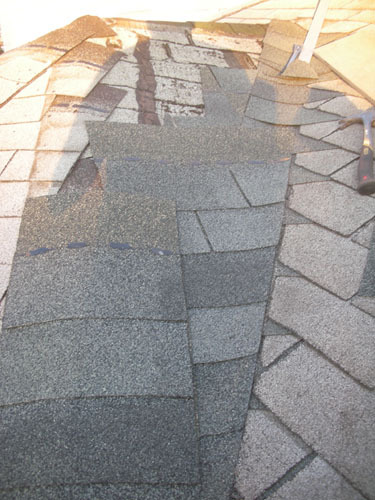 Under that, he found a third layer of shingles on the right way. Attached to that, and sticking through the many layers of stupid shingles, somebody had just left the aluminum support legs for a satellite dish. The North side of the bay has had the worst damage, and what was left under there was pretty yucky. As you can see, there was quite a bit of water damage in there. Here it is all stripped of shingles. As it happens, the ridge that should slope slightly downwards away from us here actually slopes back towards the house, which is a huge water issue. That means this bay should be roofed as if it were a witch's cap roof, rather than as if it were a bay. In order to drain the water off the roof without it going into the house, Noel used shingles to create a trough in the valley. This is a kind of cheap detail for re-roofing, but we're not building a 25-year roof here (I hope). If we were doing a nice roof, I would insist there be metal flashing in the valleys. Of course, the roof we eventually want to put on this house will be metal, not asphalt shingles, so the water running off won't be polluted. After shingling up the valley, Noel carefully shingled up the side of the bay. Note the nicely trimmed shingles there. 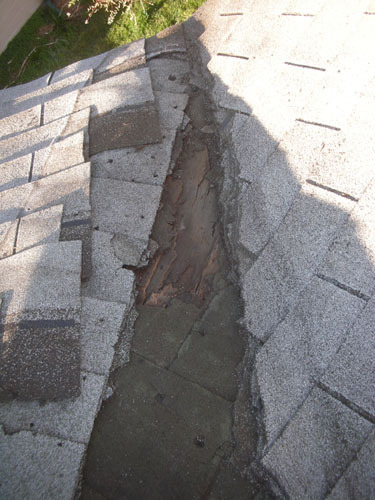 Since the roof surface he was working on was so wonky, he used pieces of shingles to shim out the surface so it would drain properly. As the sun was setting, the dogs and I went out to see how things were going. He was all Freedom Rock-ing it up on the roof, working his way through the packages of shingles methodically. I admit, I'm not helping because for some reason being on the roof triggers an irrational fear of heights (I never used to have this reaction, so I put it down to being OLD). Not Mr. Monkeypants, though. Apart from having to spend the evening curled up with a heating pad, complaining about his back, Noel seems to suffer no ill effects from bouncing around all over the roof. Shingling one half of the bay took about three hours today. There's still the North side to do, but that should go somewhat faster. I know that money is tight, but I can't understand why you're doing any work inside the house when the roof is such a problem. Not trying to argue with your logic or anything like that, just curious. I promise I will NOT look at this site again, ever...it's just too scary. Rae, you do bring up a good point, but let me clarify: the roof leaks only a small amount, and it leaks not onto the dining room ceiling but into the attic. We can go into the attic and keep water from getting into the dining room (lay down plastic and towels, or make an elaborate arrangement of buckets, as we have in years past). All the damage happened because previous owners just let the water drip from the attic into the dining room ceiling without mopping it up -- it doesn't fall directly onto where the drywall is. The really bad water leak was repaired with the goop we put in a while ago, and that's not leaking at all. The real danger with a small leak is in ignoring it (for, say, 40 years). 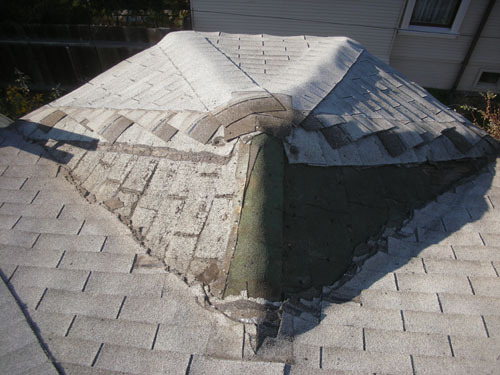 Cumulative damage can get pretty bad, but it doesn't happen overnight or even in one season. Clearly, Mr. Whatever, this is not the site for you. It almost makes you wonder why you even bothered to flounce in the comments. Roofs scare me. As a matter of fact those photos give me the creeps. It looks like he could slide off at any moment. 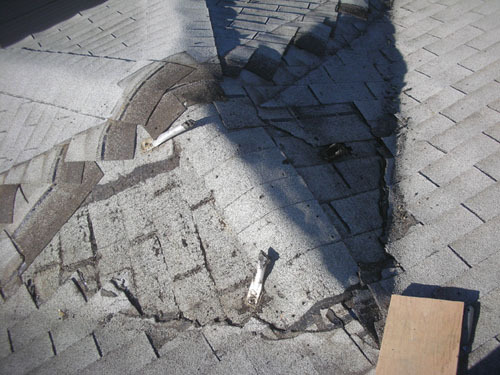 Our roof was previously shingled (1 year before we bought it) by baffoons who did a horrible job and did not understand the proper way to install flashing. That job will be first on our list in the spring, snow is falling now. My husband is in bed tonight with a heating pad and electric blanket because he was in the crawl space all day redoing duct work that was installed incorrectly and is falling apart. I wish I had the guts to do roofing, but you will never find me on a roof, unless maybe it's a chicken coop roof. Hey, congratulations on the progress!! In contrast to Mr. Whatever, I appreciate your informal style and sense of humor about the many struggles and surprises of owning an older home. 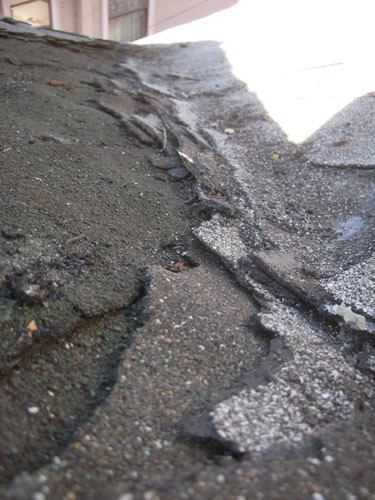 We too are working to repair the accumulated damage of years of neglect. I know what it's like to cobble together a roof while saving for a new one. Don't let his comments get to you. 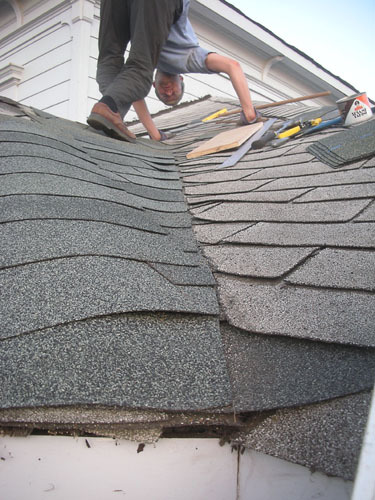 You are doing it a good job, and eventually you'll get your new roof and not have to deal with buckets in the attic anymore. Keep up the good work. Hey - glad to see you're back. I live vicariously through your blog. A few weeks (months?) ago I asked if you'd buy an old house again & you said you would. But you gave me honest pros & cons. We decided to buy a 1962-era house. Not old, but not without some charm (or at least hardwood floors and real plaster walls). I travel too much to get to fix up an old house. 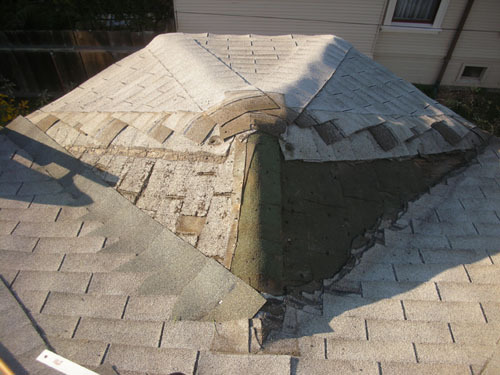 Good going on the roof - it's smart to fix it "good enough" until you have the money to do it right. Mr. Whatever would probably rather you take out massive home equity loans and do it all right away. He's a tool (and not the good, useful kind that comes in handy). Hi, Pam! Glad my advice on the old house thing helped -- I think this level of old house is not for everybody. But it's definitely what we wanted. And in this economy, massive home equity loans are not even a possibility. The whole thing is roofed like a shed addition on the side of the house, and of course they didn't bother with flashing where the roof meets the brick wall - they simply stucco'd over the roof tiles! You can see daylight through the gap. It's a dirty secret of the home renovator: we go look at other people's houses just so we can feel better about how badly ours got muddled up. Mr. Whatever must not have read that this is a temporary patch until the metal roof comes into the budget items. And now that he's left the scene, he won't benefit from the work you do then. My hubby's thought on the patch, tho, was this - if you haven't pulled up the once-wetted sheathing, you are opening up yourselves to an attic mold issue. So my question becomes - how's the ventilation up there? Jenn, the thing about our roof is that the sheathing is solid wood planks (less susceptible to mold than engineered wood products like OSB), and they are completely open on the back side with excessive ventilation (in high winds, a stiff breeze goes through our attic). Attic mold is the very least of our problems; we are extremely well ventilated and won't have to worry about damp and moisture issues for some time. The nice ventilation situation is why I have not been too worried about moisture in our walls. It's freezing cold in here, but the one thing it is not going to do is mold up.